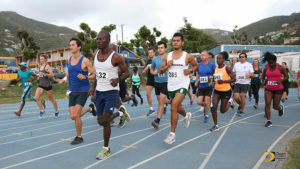 The only road racing series on Tortola that ran its course in 2017, the Hauteville 5K Series—formerly the Blenheim Trust 5K Series—opened on Saturday with Julius Farley leading the parade of 45 runners in a race that started and ended at the A. O. Shirley Grounds, on a tour of Road Town, dubbed the City Circuit. While Farley was at the top among the men, Katrina Lindsay was the fastest woman in the field. Farley said he knew Reuben Stoby, who had dominated local road racing over the last few years, would be trying to catch him, but managed to hold on to the early pace he set to become victorious. Stoby was the only other runner under 20 minutes in 19:24. Stoby said it was a good experience to be out running which he considers the official start of the running season and it was good to see all the people out. Lindsay said it was a good run to start the season, as it wasn’t hot and there were no hills. Lindsay was the only woman breaking 22 minutes with her 21:06 time. She has been competing in the BVI Athletics Association meets and said doing middle distances have helped her. “I have more endurance,” she said. Bill Kinkead, 79, was the oldest participant and was looking forward to the St. John 8 Tuff Miles. Race director Kay Reddy it was a great start to the series. Final results. Men: 1. Julius Farley, 18 minutes and 41 seconds. 2. Reuben Stoby, 19:24. 3. Guy Williamson, 20:42. 4. Anthony Daway, 20:53. 5. Emrol Amsterdam, 21:29. 6. Derek Rawlins, 21:33. 7. Marcus Hallan, 22:04. 8. Zebalon Mclean, 22:39. 9. Micho Schumann, 22:42. 10. Claudius Rymer, 22:43. 11. Adrian Dale, 22:52. 12. Al Brodrick, 23:00. 13. Sergio Dantas, 23:13. 14. Rush Brodrick, 25:43. 15. Gabriel Obregon, 25:45. 16. Andrew Chen, 29:11. 17. Eduardo Devera, 33:10. 18. Bill Kinkead, 34:37. 19. Patrick Ormond, 35:45. Women: 1. Katrina Lindsay, 21:06 2. Rosmond Johnson, 22:17. 3. Kay Reddy, 24:15. 4. Lauren Williamson, 25:02. 5. Jessica Brodrick, 25:10. 6. Jasmine Wong, 25:23. 7. Richie Paul, 26:01. 8. Natasha Ruscheinski, 26:39. 9. Darwn Peters, 27:05. 10. Karrina Stead, 27:38. 11. Yegane Guley, 27:56. 12. Anna Kinkead, 28:11. 13. Jane Thorp, 29:31. 13. Cayley Smit, 29:31. 15. Saungie Liburd, 30:22. 16. Elizabeth Buratti Clifton, 30:23. 17. Samiramis Sarkardei, 32:29. 18. Julie Schneider, 33:34. 19. Fresa Indira Del Rosario, 34:07. 20. Claire Santillan, 34:12. 21. Sacha Joyce, 34:30. 22. Elsie Ormond, 35:45. 23. Aurelie LeGangneux, 35:48. 24. Pearl Banday. 41:32. Walkers: 1. Shirley Liburd, 43:48. 2. Sophie Bennett, 44:01.